Home » Posts Tagged "revenue"
KPERS officials explain the “what ifs” of Brownback’s irresponsible budget. Short version: DISASTER for KPERS. Brownback’s Budget proposal would reduce KPERS contributions by a total of $600 million, extend the time to pay down KPERS’ existing unfunded actuarial liability by 10 years, and add $6.5 billion to the State’s contributions over the long term to pay for it. The full breakdown of the effects of Brownback’s proposal on KPERS is included in today’s Under the Dome. Brownback’s plan mortgages the future to pay for the $350 million budget hole which remains through the end of this fiscal year. There are solid and sensible solutions which take a comprehensive approach to dealing with the Governor’s failed experiment. It is important that we all educate ourselves on the nature of the problem and the solutions so that we can encourage our legislators to take the bold steps necessary to achieve long-term results (those solutions are outlined in today’s under the dome and in more detail RIGHT HERE). Governor recommends bills for health benefit consolidation. With the start of the new legislative session, the Governor has announced his budget recommendation for Fiscal Year 17 (current revised), 18 and 19. 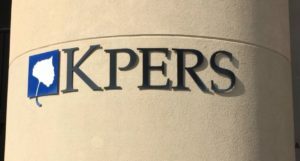 In short, the proposal would reduce KPERS contributions by a total of $600 million, extend the time to pay down KPERS’ existing unfunded actuarial liability by 10 years, and add $6.5 billion to the State’s contributions over the long term to pay for it. What we don’t pay for now costs more later. In FY 2016, the Sate delayed its fourth quarter payment for State/School employer contributions with a promise to pay it in FY2018 with interest. Governor’s Recommendation: freeze contributions in FY2017, 2018 and 2019 to the reduced amount paid in FY2016. Governor’s Recommendation: Pay off the existing unfunded actuarial liability over an additional 10 years. *Doesn’t affect Local employer contribution rates. It’s most important to remember that this does not affect benefits for current retirees, or even for those thinking about retiring. KPERS has $17 billion in assets to pay benefits for many years. The funding shortfall is a long-term funding issue. However, underfunding continues to add to the unfunded liability and undermines KPERS’ long-term strength. The State’s recent $1 billion pension obligation bond was a significant step in the right direction. But it’s consistent and full employer contributions over time that will make the most difference in having a sound and sustainable retirement system. We are at the beginning of the session. And budget legislation will wind its way through the usual process. The Governor’s proposal is a starting point for discussion. We’ll keep you posted as things affecting KPERS develop in the months to come. So far the Governor’s proposal is getting a cold reception under the dome. As we reported last week, the K-12 Education Budget Committee has recommended to the full Appropriations Committee that they reject the Governor’s KPERS proposal. You might be wondering what the H-E-double hockey sticks is going on up here in Topeka. You know that there’s a big problem facing Kansas and that problem has been caused by the reckless and irresponsible tax policy proposed by Governor Sam Brownback and passed with great joy by his legislative allies. That’s true. And here, after four years, Kansans learned the lessons of trickle down economics/tax policy and have thrown many of those responsible out of office, replacing them with new moderate Republicans and Democrats. So this should be the right time to put the brakes on the Brownback disaster and reverse course. It should be easy, you’re thinking. Oh, that it were so simple! 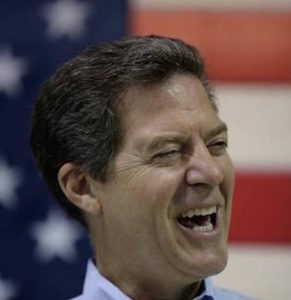 Brownback issued his “balanced” budget and it’s a doozy! Essentially, Brownback achieves “balance” by mortgaging the future. He robs from the highway plan, he sells off our tobacco settlement money turning this long-term asset into long-term debt, and he steals from KPERS reversing all the hard work done by previous legislatures to stabilize and secure the system. That’s one way to take care of the issue but let’s take a look at the deeper problem. First, we are dealing wth three years. Problem one is to find about $350 million to fill the hole in the last six months of fiscal year 2017. The next problem is to solve the revenue decline so as to fix the holes in future budgets – notably fiscal years 2018 and 2019. Then there is the problem of a Governor who continues to believe his plan is working despite all the evidence to the contrary. Next, we have a legislature with an enormous number of freshmen, many of whom are just getting their feet on the ground and beginning to understand the process. Remember, we are only 10 days into the 2017 session! And finally, we are faced with two separate and individual committees in each chamber tasked with the hard work – House Appropriations and Senate Ways and Means that craft budgets (spending) and House Taxation and Senate Assessment and Taxation that craft tax policy (revenue). Somehow, we need to get a revenue plan that corresponds with our budget or spending plan. Not so easily done! So far – 10 days in – we have only ideas. Okay, we have one bill, HB 2023 that repeals the LLC tax exemption; but really, that’s it. Another idea is to fix the revenue by reversing the Governor’s policies. The LLC repeal is part of that. The Rise Up plan is another way to do that. And a third idea – if you don’t like mortgaging the future or reversing the tax cuts – is to cut spending. There is no bill out there proposing that we cut spending. But things do need to be talked about. And some ideas can be floated to get people thinking about other ideas. No legislator likes to cut spending or raise revenue (aka raise taxes). And right now there is little interest in mortgaging the future. In order to get people to think that raising revenue needs to be on the table, we have to get them to see what happens if we do not raise that revenue. This is why leaders will ask what spending cuts look like. Legislators are always reluctant to raise taxes and you can be sure that those who support the Governor will all any reversal of his tax policies an increase. Understanding what the alternative looks like – ruined highways, compromised public safety, stripping seniors and those with disabilities of service, and even cutting public school funding – will help legislators understand the importance of passing a revenue plan that supports vital government functions. So, it’s early. The new leaders in the House and Senate are not showing support for cutting services more. But the discussion is important. Unless all legislators understand the depth of the problem and the ramifications of taking one path or another, they won’t be ready to make the hard decisions that are yet to come. Don’t panic yet. But do continue to communicate with your legislators. Let them know that you expect them to deal responsibly with the failed tax policy of Governor Brownback. Make sure all Kansans expect the legislature to reverse course on revenue and support quality state services across the board. Two bills recommended by the Governor have been introduced. One would enact the consolidated health insurance plan for all school districts while the other would establish a centralized procurement program for school districts. Both bills were introduced as committee bills in the House K-12 Budget Committee in order to have the discussion on these issues. Under the leadership of Governor Sam Brownback and the willing participation of conservative Republicans in the legislature, the state budget continues its long collapse. Just the other day, it was revealed that tax receipts for August were off yet again; this time by $10.5 million. Nearly every month since the Brownback tax policy passed by his conservative legislative allies in 2012 took effect, collections have missed the mark. Even after Brownback and his allies passed the largest tax increase in state history, dramatically increasing sales taxes and slashing your income tax deductions, revenue continues to decline. Last month state agencies were directed to prepare budgets showing what a 5% cut would look like. And with the August revenue collections being off once again, it’s looking more and more likely that those cuts could be a reality for agencies already reeling from the loss of funding. And while you might think that $10.5 million is not really a lot of money in a state budget, remember that the revenue collection estimates have been repeatedly ratcheted down as collections come in below expectations. All of this is having an impact on the Brownback allies. After being ignored by their representatives in the House and Senate, Kansas voters have decided to take matters into their own hands and in the August primary election, many of Brownback’s allies were ousted in favor of more moderate, responsible Republicans. And let’s not forget that there is another chance for voters to be heard in the November election. Those Brownback allies still in office but facing a challenge in the November election are Senators Dennis Pyle, Steve Fitzgerald, Jim Denning, Julie Lynn, Mary Pilcher Cook, Ty Masterson, Rob Olson, Mike Petersen, and Susan Wagle and Representatives Kevin Jones, Jene Vickrey, Keith Esau, Amanda Grosserode, James Todd, Willie Dove, John Bradford, Tony Barton, Marvin Kleeb, Scott Schwab, Ron Highland, Ken Corbet, Lane Hemsley, JR Claeys, Marc Rhoades, Will Carpenter, Pete DeGraaf, Joe Scapa, John Whitmer, and Kyle Hoffman. Voters have choices in all of those races this November and it’s beginning to look like living a life of fealty to Sam Brownback instead of to your constituents might not be good for your electoral health. A new poll commissioned by Republican Senate Leadership is bad news for those on the above list. When asked if they would vote for a Senator who supports the Brownback agenda, 57% of voters say they would cast their ballot for the Democrat. Only 21% of voters have a favorable view of Brownback and only 19% look favorably upon the legislature – the legislature that has blindly followed Brownback down the path to fiscal collapse. A full 75% of voters called the Brownback tax plan unfair. Voters were asked which issues were of greatest importance to them. Leading the pack was K-12 education, the number one issue for 35% of voters. Tied for second place at 15% were state government spending and job creation. You can read all about the poll in a Topeka Capital-Journal article. Click here. 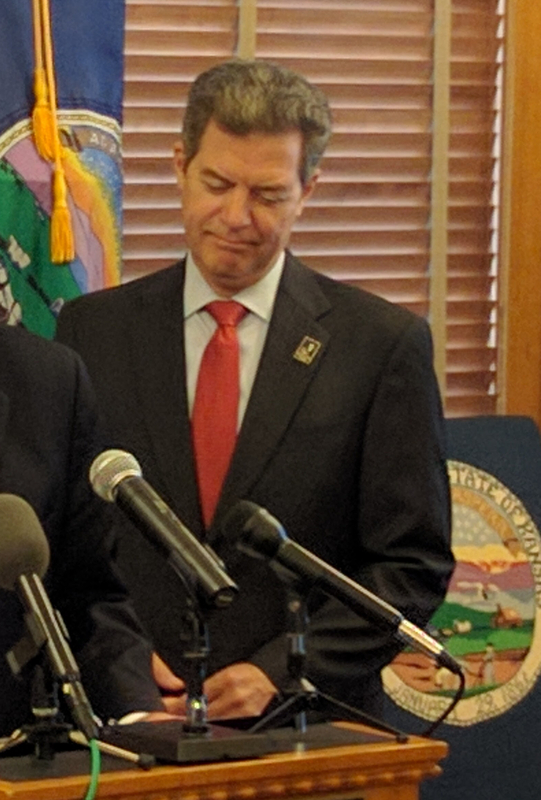 In response to yesterday’s reduction in estimated tax collections, Governor Brownback and his Budget Director Shawn Sullivan quickly released three proposals to balance the budget. The first option would take nearly all of the remaining sales tax revenue dedicated to maintaining roads and highways further jeopardizing the safety of Kansas’ transportation infrastructure and extend a 3% reduction to Universities into FY 2017. Under this option he also asks the legislature to give him permission to bond the tobacco fund money (known as the Kansas Endowment for Youth and the Children’s Initiative Fund) and turn this continuing revenue source into a continuing debt. 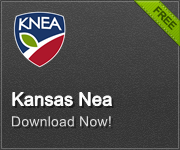 This money is currently used to provide services including pre-school for Kansas children. The Governor promises that most of these programs would be preserved in the state general fund. But of course, we know what happens to such promises as the state’s revenue stream continues to erode. The second option also takes the highway fund money and continues the reductions to Universities as in option one but instead of selling off the tobacco receipts delays more payments to KPERS and delay paying KPERS back until 2018. Don’t forget that the Governor has already delayed $93 million in KPERS payments. Option three is expected to delay another $99 million in KPERS payments. Option three takes the highway fund money as in options one and two but instead of delaying more KPERS payments or bonding the children’s initiative fund asks the legislature to give the governor the ability to cut most state agency budgets between 3 and 5%. Under this plan K-12 education would be cut by more than $57 million. Brownback and his allies are full of promises to Kansans. They promise that they will fund pre-school programs even if they sell off the tobacco settlement money. They promise that they will repay the KPERS funds with 8% interest. They promise that their radical reckless tax cuts will be a shot of adrenaline into the heart of the Kansas economy. They promised that their education block grant program would provide certainty in school funding. But after four years of continuing economic collapse and broken promises, what faith do any of us have that they will keep any of their promises in the future? If revenues continue to decline, what promise will they break first? Dump pre-school programs? Renege on the 8% interest on KPERS fund delays? Don’t pay back KPERS at all? Make ever deeper cuts to K-12 and higher education? We wonder how much faith the people of Kansas have that promises made will be kept. Back in 2012, when Brownback launched his “glide path to zero income taxes” plan, based upon advice from the architect of trickle-down economics Art Laffer the plan eventually ended up in Senate Substitute for House Bill 2117. It was initially voted down in the Senate but after moderate Republican senators were persuaded by Brownback that the bill as it was would never become law – it was only a vehicle to get a tax conference committee to write a better plan – there was a vote to reconsider and the bill was passed and sent to the House. There, the much more conservative House moved to concur in the changes to HB 2117. At first the bill was not passing but after a long call of the House and much arm-twisting and wood-shedding from House leadership and the Governor, 64 votes were cobbled together and the bill became law. Since its passage the revenue situation for Kansas has been grim. 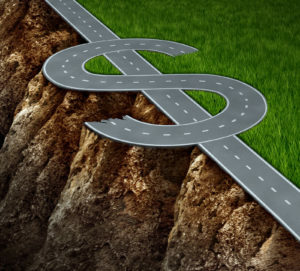 Month after month, revenues have declined resulting in massive spending cuts and sweeps of millions of dollars in fee funds and highway fund to shore up the budget. In desperation, the Governor called for the largest tax increase in Kansas history – a sales tax increase that, like Laffer’s trickle-down plan for income taxes, falls heaviest on the lowest income Kansans and has driven residents of border counties across state lines to shop for food. Despite the sales tax increase, revenues have continued to fall until we came to yesterday. Now we are faced with even more draconian cuts to already badly damaged state services. So who among today’s incumbent legislators were among those in 2012 who enthusiastically embraced the Brownback agenda? Alford, Arpke, Bruchman, DeGraaf, Denning (now a Senator), Garber, Goico, Grosserode, Hedke, Hildabrand, Hoffman, Huebert, Kelley, Kerschen (now a Senator), Kiegerl, Kleeb, Knox (now a Senator), Mast, O’Brien, Osterman, Peck, Powell (now a Senator), Rhoades, Rubin, Ryckman, Sr., Scapa, Schwab, Schwartz, Seiwert, Smith (now a Senator), Suellentrop, Tyson (now a Senator), and Vickrey. Abrams, Bruce, Donovan, King, Love, Lynn, Masterson, Merrick (now in the House), Olson, Ostmeyer, Petersen, Pilcher-Cook, Pyle, and Wagle. So far most of the above legislators have shown little appetite to revisit their tax cuts and put Kansas back on the road to recovery. And the original group of moderate Republican Senators who reversed course when the Governor assured them this bill would not be the final product? The Governor joined the campaign against them and managed to oust all but McGinn, Longbine, and Schmidt from the Senate, replacing them with more obedient conservative Republicans. Look at the list carefully. We expect that many of them will soon be campaigning for re-election. Feel free to ask them about their votes on tax policy when they come knocking on your door. Oops! We Missed it Again! New revenue figures just out showed that the state missed revenue projections yet again – this time by $53 million. Kansas was down significantly in both income tax and sales tax receipts. The budget bill passed by the legislature and not yet signed by Governor Brownback, left the state with a $6 million balance so the figures in today put Kansas once again in the hole. And yet we still have not heard a whisper from House or Senate leadership or the Governor about how to stop the bleeding. Months and months of continual losses have jeopardized all state services from highways to public safety to education and everything in between. Still leadership refuses to acknowledge what most Kansans have already figured out – the disastrous and reckless tax cuts of 2013-13 have bankrupted the state. How they can continue to cut rates and allow more than 330,000 businesses to pay no income taxes at all and expect revenues to increase boggles the mind. None of the figures accounts for the requirement that the legislature restore equity to the school finance system. This has been estimated to be somewhere between $54 and $100 million. Brownback has the authority to line-item veto portions of the budget bill to make up some of the deficit. The bill also gives him permission to use up to $100 in KPERS payments to shore up the budget but this money is required to be paid back to KPERS with 8% interest by September. Such a payback would certainly require a big turnaround in collections. This is the atmosphere in which the legislature returns to Topeka tomorrow after their turnaround break.